Soak the Cranraisins or cherries in the amaretto for 30 minutes. Combine the ricotta and sugar in a small bowl and whip until smooth. Add the mascarpone and stir to incorporate. Be careful not to overmix or the mascarpone will separate. Fold in the pistachios and Cranraisins with the amaretto soaking liquid. Transfer to a pastry bag fitted with a plain tip and pipe the mixture into the cannoli shells. Try to do this close to serving time as the shells may loose their crispness. Dust with powdered sugar using a sieve. 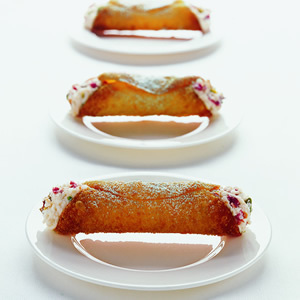 If you are game, you can easily make the cannoli shells using eggroll wrappers. The hard part will be finding something to use as a mold. I use aluminum tubing that was cut to the proper length at a hardware store. Cut eggroll wrappers into circles 4 inches in diameter. Stretch around pieces of aluminum tubing that are 1 inch in diameter and 4 1/2 to 5 inches in length. Moisten the overlapped flap of dough with water to seal the wrapper. Fry in a skillet in medium hot oil turning with tongs as necessary, until golden brown and crispy. Remove immediately using tongs and stand tubing on end on paper towels. When cool, slip the cannoli shells off the tubing. Rather than using the cannoli shells, slice a 2 pound loaf of pound cake, about 8 1/2 x 4 1/2 x 2 1/2 inches, into 3 horizontal layers. Drizzle the layers with amaretto liqueur. Spread the ricotta filling on all the layers and reassemble the cake. Cover tightly with plastic wrap and refrigerate. Garnish the top of the cake with cranraisins and toasted pistachios. To serve, slice the cake and garnish with chopped Cranraisins and toasted pistachios.